15 Jan 2012 | Neal Pollock, Ph.D. The term “fitness to dive” includes a wide range of elements: medical and psychological fitness, appropriate knowledge, adequate physical skills and adequate physical fitness. Breaks from diving can compromise readiness in many of these areas. This article will discuss physical fitness in light of breaks from diving. Some divers can get in the water regularly. Others may face substantial breaks between dives, with activity restricted to annual vacations or seasonal conditions. A host of factors can result in extended periods of time spent on dry land. Periods of nondiving may be associated with greater or lesser physical activity than might be normal during diving. Picture the triathlete, for example, who may not make time to dive for many months while training for a competition. Declining physical fitness is not likely to be an issue. For each case like this, however, there are probably far more in which the hiatus is associated with reduced physical activity: Life gets busy, and things get put off. The forces that keep divers out of the water may also have them cutting back on regular exercise. In such cases, the return to diving can be problematic. If they are not practiced, physical skills will deteriorate; this is the use-it-or-lose-it adage at work. Some divers take advantage of refresher programs or review training materials when they feel they might be rusty. Physical fitness requires the same consideration. Has your fitness level suffered? Will you be able to comfortably squeeze into your suit? The experienced diver knows that good neutral buoyancy skills can make the overall energy demands of most dives pretty modest. But did the refresher training do enough to bring buoyancy control back to a high standard? What about the most physically challenging elements? Standing up and walking in full gear, surface swimming, water exits and, of course, any unexpected or emergency events. A little bit of “what if” time should remind you that a series of small compromises could turn a nonevent into a serious situation. The solution? Well, you could always hang up your fins for good. Everyone should probably do that eventually. We have a lot of control, though, on when that “eventually” needs to be. A better strategy would be to make sure we are ready to play our games when we want to play. The things we need to maintain our options are honest self-appraisal, habitual physical activity and consideration of activity-specific fitness needs. Meeting these obligations not only reduces the challenge of return to diving after a break, it improves readiness for all diving and other physical activities. Honest self-appraisal is a challenge to us as a species. Common lapses range from unawareness to self-delusion. While issue avoidance and the proverbial rose-colored glasses can be compelling, a pattern of honest, objective appraisal is healthier. If we are honest with ourselves, most of us are reasonably capable of judging our readiness to perform in an arena we understand. Such an admission is the first step to recovery. Once you’ve identified the problem, the next step is to act. Physical fitness over the lifetime is important to protect our general health and our capabilities. By staying in reasonable shape, we eliminate a huge barrier to participation in or return to diving, or almost any other activity. The U.S. Surgeon General has long recommended regular physical activity on most days of the week (Physical Activity and Health, 1996). We did not need the Surgeon General to tell us that, though. We just need to do what we know is reasonable. The choice of physical activities for general health is wide open. Good choices will include components for strength, aerobic and dynamic/flexibility. Running, swimming, cycling, walking, volleyball, racquetball, soccer and dancing are just a few examples of activities that can form the core. The most important thing is to choose those that fit your preferences, schedule and abilities. Alternating activities can make things more interesting and reduce the likelihood of overuse injuries. Working with a partner will make it easier to keep going. Joining or establishing a peer group and/or combining physical activity with other interests can also be effective. For example, hiking and kayaking might be combined with bird watching and/or photography. Swimming is a great choice of exercise for many reasons. It involves many muscle groups and improves aerobic capacity. It produces relatively low joint forces and thus is less likely to cause injury. It will also improve comfort in and around the water. While many debate the threshold swimming ability appropriate for safe diving, most will acknowledge that enhanced skill would be a good thing generally and a definite plus in emergent events. There are a lot of ways to get into swimming. For many, simple lap sessions might be appropriate both for fitness and as an escape from the stressors of the day. Traditional lessons and stroke improvement classes may help those needing assistance. The more social lap swimmer may prefer a master’s club. Others near active aquatic centers could find or encourage intramural water polo, underwater hockey, breath-hold training or other programs. You need not be an expert in an activity to get a physical benefit. A poor swimmer, for example, working for every stroke, can get a better workout than a skilled swimmer lugging along. Additionally, the satisfaction of developing new skills may be motivational in its own right. The conversation to this point has focused on regular physical activity. This is important in the return-to-diving question since maintaining fitness reduces the problems of a break in activity. Exercise should be a part of our basic routines. Good intentions aside, though, we know that this is often not the case. A recent study found that only 20 percent of the adult population reported strength training more than two times per week (1998-2004), less so with increasing age and despite initiatives to increase participation (Kruger et al., 2006). We each need to draw on our personal initiative to reverse this trend. So, what about the dive trip coming up right away? Are you ready? It’s honest self-appraisal time. Take stock of your situation. Gather your gear. If you hesitate at all in setting it up or mentally walking through the steps of dive planning, refresher training should be top priority. Using your own gear for the retraining will allow you to test it and yourself under supervised conditions. Ensure that all the appropriate servicing is complete. Address any fit issues to reduce the chance of unpleasant experience. If a suit is tight when you put it on in the living room or poolside, it will probably feel worse as you enter the water after too long on dry land. Refresher dive training will frequently focus solely on basic diving techniques. It is in your best interest to test your general abilities as well. Are you physically, medically and psychologically fit? Stressful times and excessive fatigue might make a dive too much to handle. In such cases, it would be best to delay diving until you have had some recovery time. Enjoy a bit of vacation time before you get into the water. If physical fitness is the only question, then the pool may be the best place to answer it. Can you complete a continuous 200-meter (656-foot) snorkel swim in less than seven minutes without difficulty and without needing to rest after finishing? Can you do head- and feet-first surface dives to the bottom at 12-15 feet (4-5 meters)? Can you pick up, don and clear your mask and snorkel from the same depth on one breath? These quick tests are not definitive, but if you can complete all of them, then your physical fitness and snorkeling skills are probably reasonable. 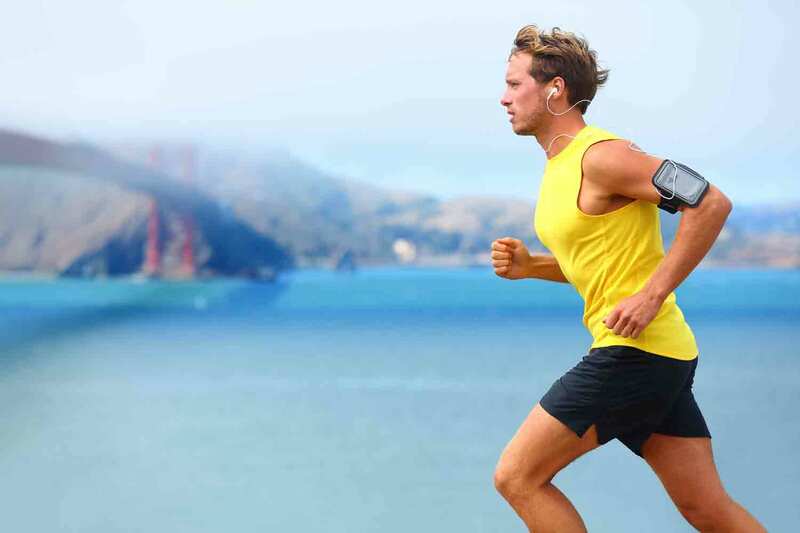 Immediate practice of each skill will not improve physical fitness, but practice will improve physical competence, which is always important but even more so if your fitness is not optimal. The pool is also a great place to first test your neutral buoyancy in full gear. Yes, you will have to add weight to be neutrally buoyant in salt water, but the pool test will get you close. Remember that the amount of weight required often changes as experience grows. 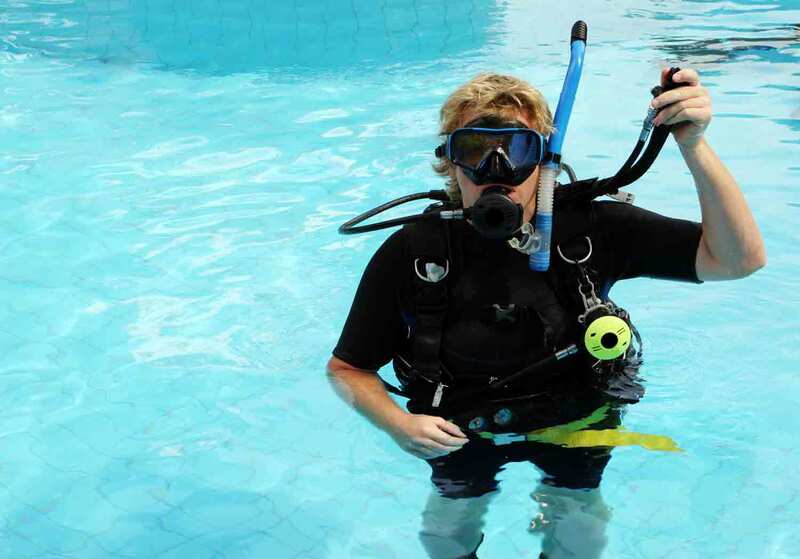 Most divers require less weight as they relax and gain comfort and confidence underwater. Conversely, putting on weight in personal soft issue may demand additional external weight. In either case, it is better to get close to appropriate weights in the pool without the additional pressures of holding up a group or making major weight belt adjustments under less ideal circumstances. If your performance is far off the mark during your pool session, you may want to postpone your return to diving and work a little more on your skills. After all, you have to consider the health, safety and enjoyment of yourself, your buddy and anyone else who would be affected by your performance. At the start of the trip, if you are close but not sure, schedule a one-on-one or small group session with a diving instructor under entry-level environmental conditions before your main dives. While it may not seem like an auspicious beginning, starting with a relaxed, problem-free dive may be the best way to make it a relaxed and problem-free trip. When you get home, you will be in the right frame of mind to think about additional steps to take to ensure your readiness for the next trip. Dr. Neal Pollock is an a research physiologist at the Center for Hyperbaric Medicine and Environmental Physiology, Duke University Medical Center, in Durham, N.C.